Making Jack Lemmon cry is a delight reserved for demented people, but—when he was alive—there WAS a way to make the man weep. Just show him the last scene of City Lights. If you can get hold of the American Film Institute’s Top 100 Laughs TV special, you can see for yourself. Lemmon cries while describing the end of this movie. Then I cried. My wife laughed. She’s such a little trooper. I won’t give away what that last scene is, but it’s easy to see how it could make a person bust up just thinking about it. Charlie Chaplin was certainly not afraid to hit those maudlin notes. His Tramp character was lovable enough and Chaplin the artist was talented enough to get away with milking you for every emotion you’ve got. Funny how some people can mix tones in the same movie and make it work so well while others can’t even get one tone right. The story: the Tramp makes friends with a blind flower girl (Virginia Cherrill) and works various jobs to help support her. She doesn’t know he’s broke, instead thinking he’s a rich benefactor. Along the way he tries his hand at a few different vocations, including a hilarious attempt at being a boxer. He also parties a lot with an actual rich man (Harry Myers) who spends most of the movie drunk as a monkey. Whenever he sobers up, out goes the Tramp. No one can ever see our hero for who he truly is. 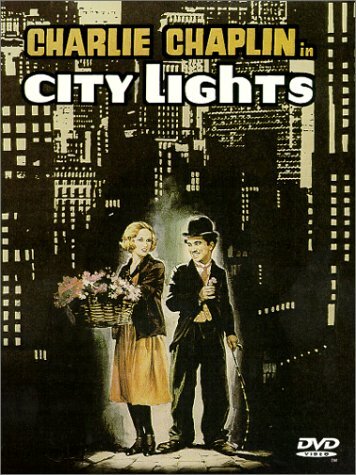 City Lights is a short and pithy movie, as were most of CC’s works. He knew how to tell a compact story with oodles of hijinks, a little drama, a message and plenty of feeling. The AFI definitely had l’amour for this picture, ranking it 76th and then 11th on their 1998 and then 2007 Top 100 lists. That’s a remarkable leap in the span of 10 years. Do you feel that strongly about City Lights too? I’m not quite as enamoured with it as the AFI, but it’s a wonderful picture. Jack Lemmon’s sloppy tears are proof. For more, check out our audio thoughts on City Lights in the podcast section!